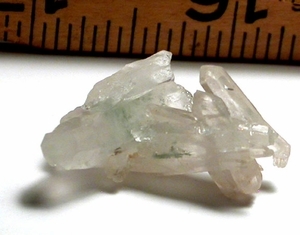 Multi-directional green chlorite included Arkansas mini cathedral cluster has CURVED crystals, a BENT crystal, crystals in parallel growth, doubly-terminated crystals and penetrated points. Also included are white titanium veils and a tiny patch of brown chlorite, nicely highlighting the green. 1x 1", thumbnail sized, Saline County.